I’m a clean freak when it comes to the inside of my house. It keeps me busy enough that I tend to put off another important part of keeping a neat and tidy home: my yard. I don’t love outdoor chores, but I grudgingly do them because I want a nice looking home. For me, the easier it is for me to do, the more likely I’ll get it done. Thank goodness for the Internet! 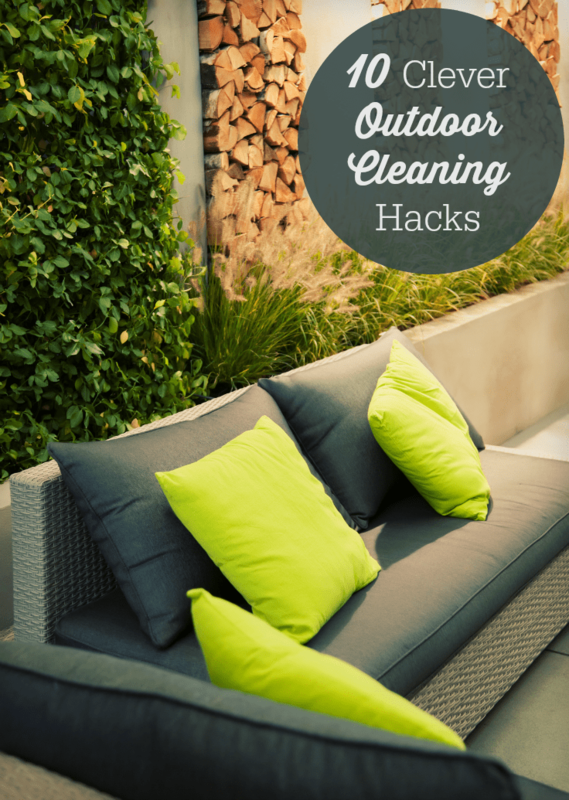 I’ve found so many clever outdoor cleaning hacks thanks to other bloggers sharing their tips. If you are struggling with outdoor cleaning, here are a list of 10 simple hacks to get the job done easily. Then enjoy the nice weather in your clean and tidy yard. That’s my plan anyways! 1. How to clean outdoor patio furniture. Use stain remover from your laundry room in this simple cleaning hack. 2. How to clean your outdoor cushions. No soap. No scrubbing. No money wasted. A simple hack to get your patio cushions looking as good as new. 3. The EASIEST way to clean a large outdoor garbage can. Smelly garbage cans are the worst. Get yours smelling fresh again with this simple DIY. 4. Cleaning BBQ grills the magic way. Go from disgusting to impressive in 24 hours! For a non-ammonia DIY, try this BBQ cleaning tip. 5. The easiest way to clean a deck. Ever hear of a Deck Washer? It’s new to me, but I’d want one if I had a deck. 6.How to clean windows and screens like a pro. Why pay hundreds of dollars for a professional when you can do it yourself with items you probably have in your home right now! 7. How to clean outdoor toys. Two easy ways to get your kids’ outdoor toys looking as good as new. 8. How to clean an outdoor rug. It’s amazing what a little baking soda and pressure washer can do. 9. How to clean garden pots. Don’t skip this important step when prepping your outdoor garden! 10. How to deep clean your cooler. Get rid of last year’s funky smells with a natural homemade cleaning solution. Have you done any outdoor cleaning yet? Great tips….cleaning windows is a big one for me! Oooh my inner clean freak loves this!! Such a great resource!! I open find myself totally clueless when cleaning outdoor items and often using the wrong products! Pinning for later 🙂 Thank you!! Thanks so much for all the great tips. I definetly will have to try them – thanks! #7 (outdoor toys) looks great! Thanks for sharing. Excellent suggestions, I am going to try the pressure washer on our cushions great tip! Great ideas! Thanks for sharing – some real money and time savers there! Thanks for the great outdoor cleaning hacks. I hope to use several of them. Thanks for sharing all these great tips, they will come in handy when I attempt to clean up around the outside. Great tips! Going to have to try the one about cleaning outdoor cushions with the power washer. Great tips. Never thought to use the power washer in so many ways!